This custom map was created for the Tahoe Donner Association in the spring and summer of 2017. I worked with the multimedia journalists Jemal Brinson and Jon Berlin at the Chicago Tribune to create the terrain data used for the interactive, web-based visualizations in their piece "The Water Drain." I built a custom internal website for Cordova, Alaska-based Points North Heli Adventures. 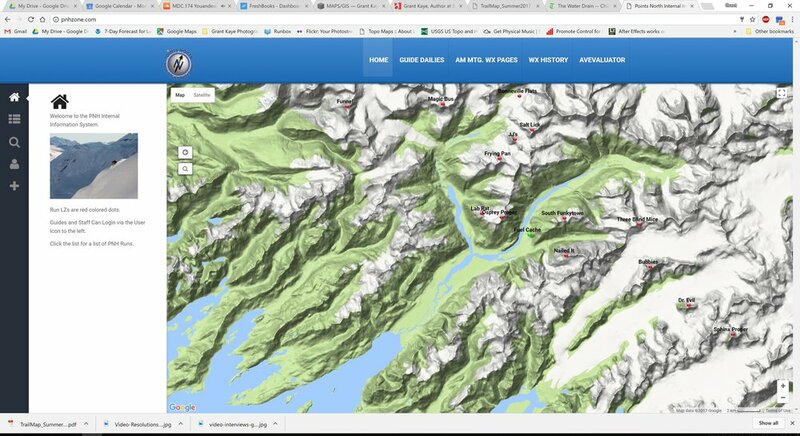 The GIS contains information on runs, zones, and terrain collected over their 20 years flying, landing, and skiing some of the most beautiful terrain on the planet in Alaska's Chugach Mountains.